Este crucero completamente narrado de 90 minutos lo lleva a lo largo del lago Maligne, el lago alimentado por glaciares más grande de las Montañas Rocosas canadienses, que forma parte del Parque Nacional Jasper, declarado Patrimonio de la Humanidad por la UNESCO. Visite la isla Spirit, accesible solo en bote, y admire las vistas de los imponentes picos de granito, las vibrantes aguas azules y los bosques antiguos. Mantenga su cámara cerca y sus sentidos alerta mientras escanea el área en busca de águilas, osos y ciervos que llaman hogar a esta área. Tanto los fotógrafos expertos como los aficionados disfrutarán de las oportunidades para capturar el paisaje alpino. El Parque Nacional Jasper es el parque nacional más grande de las Montañas Rocosas canadienses y fue declarado Patrimonio de la Humanidad por la UNESCO en 1984. Imponentes picos de granito en círculo un paraíso de cascadas, bosques exuberantes, aguas termales y una gran diversidad de flora y fauna. En el corazón del parque se encuentra uno de los verdaderos tesoros de las Rocosas canadienses, el lago Maligne. Su crucero de 90 minutos por el lago Maligne comienza en el muelle cerca del Lago Maligne, del cobertizo y los chalets. A bordo, aprenderá sobre la historia y la geología de la zona. El barco está completamente cerrado con una copa y calefacción, asegurándose de que mantenerse caliente mientras se sumerge en el paisaje alpino. Llegue a isla Spirit, cerca del centro del lago y accesible solo en bote. Aquí, le ofrecen vistas a los picos escarpados y nevados que rodean un lago azul brillante y bosques antiguos. Mantenga sus ojos bien abiertos para ver la vida silvestre que recorre la costa, incluidos los venados, osos y águilas. Su crucero termina en el cobertizo para botes, donde puede comprar una bebida caliente o un refrigerio en el albergue y chalet cercanos. Siéntase libre de quedarse todo el tiempo que quiera y disfrutar de los paisajes de la costa. Maligne Lake is lovely, especially as you approach the far half where the water is such a gorgeous blue, so it was no surprise that we had a great time. The glaciers are truly awesome as well. The highlight of the trip for us was the expert commentary by Andrew, who is funny, articulate, and very knowledgeable. He delivered his spiel in a manner that didn’t make it sound like he had done it a million times before, though he has. He was also able to intelligently field random questions from passengers. He is clearly passionate about the lake, its history, and the ecology of the region, as well as the native groups in the area. He showed genuine interest in the passengers, taking the time to ask about each of us. Francois is equally knowledgeable, I’m sure though we didn’t hear as much from him. We had a beautiful experience yesterday on our cruise..Kelli and Scott were very friendly and informative.Scenery is fantastic..Thanks to Krystal for helping us get the voucher and making trip happen..Definite must see in the Canadian Rockies! Tour was excellent. We took the 2 hr one. Meg and Maria were very professional and knowledgable. Would recommend. 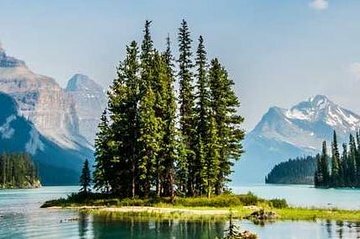 The Maligne Lake Cruise shouldn't be missed. magnificent scenery..... One piece of advice book your cruise ahead, boats were completely booked when we arrived. It's a long beautiful drive out to the lake but knowing your cruise time ahead reduces stress and who needs that when traveling.... Staff was knowledgeable and friendly. If your in Jasper you've got to go !!!. Great cruise, the scenes was beyond belief! So beautiful, and the guides were very informative. highly recommend. This was a beautiful trip but unfortunately it did not start out well. The booking company we checked in with was not familiar with Viator and did not know how to book our vouchers. It took about 45 minutes to get it worked out. Eventually we ended up with a booking and had a wonderful boat trip. Great views, though a bit overpriced. This is a great 90 minute cruise and totally worth every penny. The captain and tour guide were very knowledgeable friendly and fun. Great cruise. The scenery is breathtaking. The tour guides were very knowledgeable and personable, EXCEPT neither knew that Spirit Island was the picture on the back of the Canadian 20 bill a few years ago. This is important and interesting information to share with the many visitors to Maligne Lake. Great and friendly guides, and beautiful views of Spirit Island!